When breastfeeding stops and your baby is ready to move on to solids, you begin to pine for those good old days when “preparing” a meal for your kid was as easy as placing him or her gently on your bosom. Unfortunately, breast milk is not enough anymore and soon enough, baby is ready for fruits and vegetables, and very soon after that, meat. The choice then becomes: buy food in a jar or prepare it yourself. While most prefer making baby food themselves, the problem is, in many households where both parents are working, cooking healthy and ideally organic meats and vegetables requires time that most don’t have. I’ve found that freezing baby food saves a lot of time. Instead of spending an hour or more every day preparing several baby meals, the existence of your freezer allows you to cook a big pile of vegetables and some fruits once or twice a week, and you always have a ready meal that does not come out of a jar. Here’s how. 1. Weekend comes and you have enough time. Use baby’s nap time to cook apples, potatoes, carrots, peas, corn, broccoli, rice, meat. Cook until completely soft. 2. You can blend/mash the cooked food separately, or you can mix ingredients together. For example, carrots and potatoes makes a nice combination. Or, use say meat and broccoli. You can also add bananas to cooked apples. Your creativity might depend on how your child is accepting new tastes and textures. 3. Separate baby’s meals into single serving-size portions. A serving size will vary depending on the child’s age, size, needs, etc, but it is usually between 2 and 4 tablespoons. 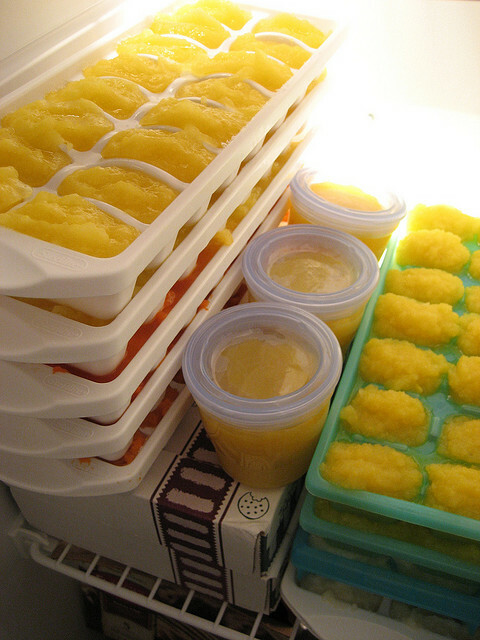 A cool way to separate portions is to place the mashed food into ice cube trays and freeze it that way. Each single-serving-size meal should be kept in a separate freezer bag. Make sure there’s NO AIR inside the bags. 4. Don’t add salt or sugar to baby food. 5. Label all freezer bags properly. It is essential to note what’s inside the bag and date you froze it. Make sure you use freezer labels that don’t come off. If they do, you won’t know when you put the food in the freezer, and you won’t know whether it’s safe for your baby anymore. 6. Sunday night comes – take several baby meals out of your freezer and place them inside the refrigerator. You need to thaw your baby’s food properly, and properly is NOT at room temperature. Try to avoid microwaves as well. The best way to thaw your baby’s food is in the fridge, overnight. 7. Work day comes and your babysitter has ready meals for your baby. So do you, when you come home from work. Warm the food evenly by stirring it, and don’t overheat it; you don’t want your baby to burn her tongue. Of course, you’d save more time if you were buying ready made baby food. However, the importance of free time pales in comparison if your baby’s healthy nutrition has to suffer. Though most frozen baby food is advertised as having no chemicals, preservatives, additives, salt, sugar, etc., it is truly impossible to know. Call me old-fashioned, but I’d rather be sure than be sorry. I want to be sure what my baby is eating, at least right now. I personally stopped following news and radio about a year ago and quit TV “cold turkey” two months back. Mind you it was during then throws of serious depression (existential crissis). My thinking is well in line with your own. The time can be better used to explore and develop stronger personal attributes to meet my life armed with genuine confidence. I absolutely love your blog and find a lot of your post’s to be what precisely I’m looking for. Does one offer guest writers to write content for you personally? I wouldn’t mind producing a post or elaborating on some of the subjects you write regarding here. Again, awesome website! Yes, I do accept guest posts. Contact me at dp@mypregnancybaby.com. Next post: What is Cradle Cap?